Battles were fought across West Maui, from Ukumehame to Honokowai. Kamehamehanui engaged the forces of his uncle from Hawai‘i to fight with him, whose troops numbered over 8,000, and Kauhi brought troops of warriors from O‘ahu. The island of Maui is divided into twelve moku; Kāʻanapali, Lāhainā, Wailuku, Hāmākuapoko, Hāmākualoa, Koʻolau, Hāna, Kīpahulu, Kaupō, Kahikinui, Honuaʻula and Kula. An area in the moku of Kāʻanapali is referred to as Nā Hono A Piʻilani (The Bays of Piʻilani (aka Honoapiʻilani.)) In the 1500s, Chief Piʻilani (“stairway to heaven”) unified West Maui and ruled in peace and prosperity. His territory included the West Maui bays, a place he frequented. From South to North, six of the identified bays are Honokōwai (bay drawing fresh water), Honokeana (cave bay), Honokahua (sites bay,) Honolua (two bays), Honokōhau (bay drawing dew) and Hononana (animated bay). In the late-1800s and early-1900s there was a horse racing track (Koko O Na Moku Horse Racing Track) at Kāʻanapali Beach that stretched from the present day Kāʻanapali Beach Hotel to the present day Westin Maui Resort. Horse races ended in 1918. Kāʻanapali was the terminus for the plantation railroad; a landing on the northerly side of Puʻu Kekaʻa with a wharf and off-shore moorings served as the primary loading spot for shipping processed sugar from the island and bringing in supplies for the plantation camps. 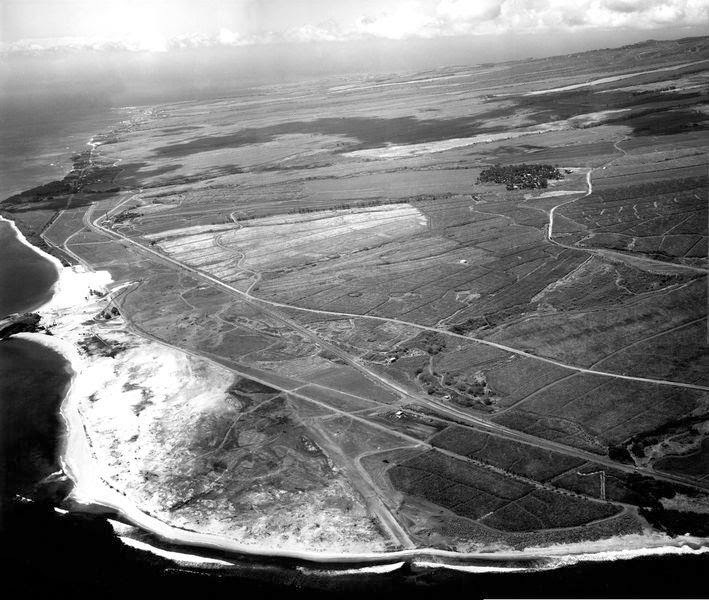 The land set-aside by Amfac became Hawaiʻi’s first master-planned resort. When it opened in 1962, it became known as the Kāʻanapali Beach Resort. Today, along its 3-mile coastline, this self-contained resort has over 5,000 hotel rooms, condominium suites, timeshares and villas; 2-championship golf courses (in 1962, Bing Crosby took the inaugural shot on the Royal Kāʻanapali Course) and 35-tennis courts. It accommodates over half-a-million visitors each year. 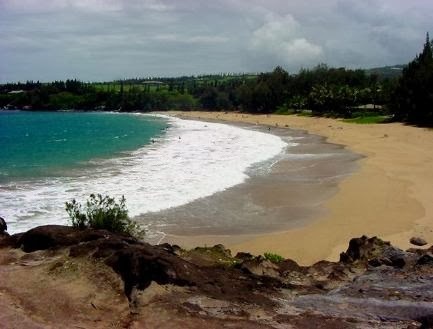 Kāʻanapali Beach was ranked “Best Beach in America” in 2003 (Dr. Beach.) A beach walk runs parallel with the sand the entire length of Kāʻanapali interconnecting the five major resort hotels and six condominiums and timeshares, as well as the numerous recreational, shopping, dining and other activities in the area. Twenty-five years after it started, the Urban Land Institute recognized Kāʻanapali Beach Resort with an Award of Excellence for Large-Scale Recreational Development. In the early years, Kāʻanapali Airport, built on an old coastal road in 1961, serviced the resort first by transporting workers and materials for the new development and then it brought guests in/out. Take-offs and landings were a thrill for pilots and passengers; the Airport’s runway (01-19) started just 30-feet from the shoreline and extended north a short 2,615-feet. Kahekili Beach Park now sits on the former Airport site. The Airport was used exclusively by the commuter aircraft of Royal Hawaiian, initially using Cessna 402 aircraft. In 1987, Hawaiian Airlines built the nearby Kapalua Airport; the State took over that facility in 1993. At the same time properties like the Kāʻanapali Beach Hotel are recognized as Hawaii’s Most Hawaiian Hotel for demonstrating an ongoing responsibility, commitment and dedication to honoring and perpetuating the Hawaiian culture for generations to come. 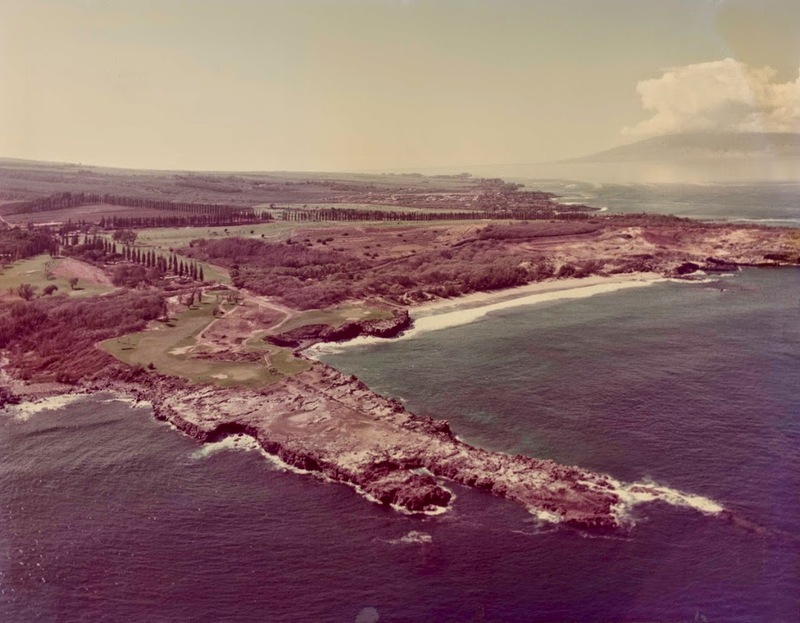 The image shows an early aerial view overlooking Kāʻanapali (Lozoff.) I have added other images to a folder of like name in the Photos section on my Facebook and Google+ pages. Kahakuloa is a valley that sits between Nā Hono A Piʻilani, The Bays of Piʻilani (aka Honoapiʻilani – the six hono bays (uniting of the bays:) from South to North, Honokōwai (bay drawing fresh water), Honokeana (cave bay), Honokahua (sites bay,) Honolua (two bays), Honokōhau (bay drawing dew) and Hononana (animated bay) to the West) and Na Wai ʻEha to the East. According to Handy the name Kahakuloa refers to a small and famous loʻi about one-half-mile inland in the bottom of Kahakuloa Valley. Descriptions differ on whether Kahakuloa is an ahupuaʻa or another type of land division. The island (mokupuni that is surrounded by water) is the main division. Islands were divided into sections within the island called moku; typically, there was a Kona on the lee side and one called Koʻolau on the windward side of almost every island. The Māhele land records indicate that much of the lands here were Crown lands with several properties going to Victoria Kamāmalu (daughter of Kīnaʻu, the wife of Kamehameha II) and a number of small awards were granted in the Kahakuloa Village region; many of these awards were granted for taro loʻi cultivation. During the mid-1800s, a large portion of the surrounding region was used for sugar cane and macadamia nut agriculture, as well as extensive cattle grazing. Haiku Fruit and Packing Co. utilized some lands in Kahakuloa to grow pineapple. Pineapple production in this part of Maui went into decline after the Great Depression in the 1930s and appeared to have ceased by the 1960s. Standing tall and overlooking the coastal shoreline is Kahakuloa Head, 636-feet high and known historically for a King Kahekili’s Leap. During the late-18th century, Maui chief Kahekili, a rival of Kamehameha, was known for many legendary feats in the ancient Hawaiian sport of lele kawa (to leap feet first from a cliff into water without splashing.) Legend says that in the early morning, the King would climb up the hill and “leap” into the ocean below from about the 200 foot height. A lot of the way is single file on a single lane road – often without makai barriers. There are hairpin turns, steep ocean-side drops and narrow one-lane sections. Along the way are the Bell Stone, Olivine Pools and Nakalele Blowhole; in the valley is the Kahakuloa Congregational Church, founded in 1887. The image shows Kahakuloa (nationalgeographic.) In addition, I have added some other images in a folder of like name in the Photos section on my Facebook and Google+ pages. In northwest Maui, the district the ancients called Kaʻānapali, there are six hono bays (uniting of the bays,) which are legendary: from South to North, Honokowai (bay drawing fresh water), Honokeana (cave bay), Honokahua (sites bay,) Honolua (two bays), Honokohau (bay drawing dew) and Hononana (animated bay). This area was likely settled between 600-1100 AD. By about the 15th century, all of Nā Hono were under the realm of Pi’ilani, the ruling chief of Maui, Kahoʻolawe, Molokaʻi and Lānaʻi. During his reign, Piʻilani gained political prominence for Maui by unifying the East and West of the island, bringing rise to the political status of Maui. Piʻilani’s power eventually extended from Hāna on one end of the island to the West, in addition to the islands visible from Honoapiʻilani – Kahoʻolawe, Molokaʻi and Lānaʻi. Piʻilani (“stairway to heaven”) unified West Maui; his territory included the six West Maui bays (Nā Hono A Pi‘ilani,) a place he frequented with his court to relax, fish and surf. One of these, Honolua, is the subject of this summary. Settlement patterns of Honolua followed patterns elsewhere, permanent habitation around the coastal and near shore lands, as well as the inland Honolua valley land. The forested and ridge-top lands were used for gathering forest products, and for forest plantings of various utilitarian Hawaiian plants. Piʻilani had two sons, according to legend, one of whom, Kihaʻaʻpiʻilani, surfed at Honolua Bay. Kekaulike, a descendant of Piʻilani, later became chief. He had two sons, Kauhiʻaimoku a Kama and Kamehamehanui, who engaged in civil war. Honolua Bay was a landing site for Peleʻioholani, ruling chief of Kauaʻi and Oʻahu (mid- to late-1700s,) an ally of Kauhiʻaimoku a Kama. Warriors would convene at Honolua Valley, prior to traveling to Honokahua Bay. Through the Māhele, the bulk of Honolua was awarded to William C Lunalilo (later King Lunalilo) on June 19, 1852. In addition, kuleana lands were awarded to native tenants. After Lunalilo’s death, his will established a trust to build a home to accommodate the poor, destitute and inform people of Hawaiian (aboriginal) blood or extraction, with preference given to older people. Eventually, the land subsequently transferred several times, culminating with HP Baldwin in 1889. In 1946, a tsunami was generated by a magnitude 7.1 earthquake in the Aleutian Islands. This tsunami struck Hawaiʻi on April 1st. Wave run-up at Honolua was recorded at 24-feet, destroying coastal improvements. Honolua Bay was the historic starting point for the Hōkūleʻa’s first trip to the South Pacific. As part of the US Bicentennial, on May 1, 1976, Captain Kawika Kapahulehua and Navigator Mau Pialug, departed Honolua Bay for Papeʻete, Tahiti. Mau navigated the leg to Tahiti with only his traditional knowledge and skills while the return leg was navigated using modern methods and tools. Following the ill-fated 1978 capsizing of Hōkūleʻa, Nainoa Thompson successfully navigated a second voyage to Tahiti – a 6,000 mile round trip – with Mau on board in 1980. 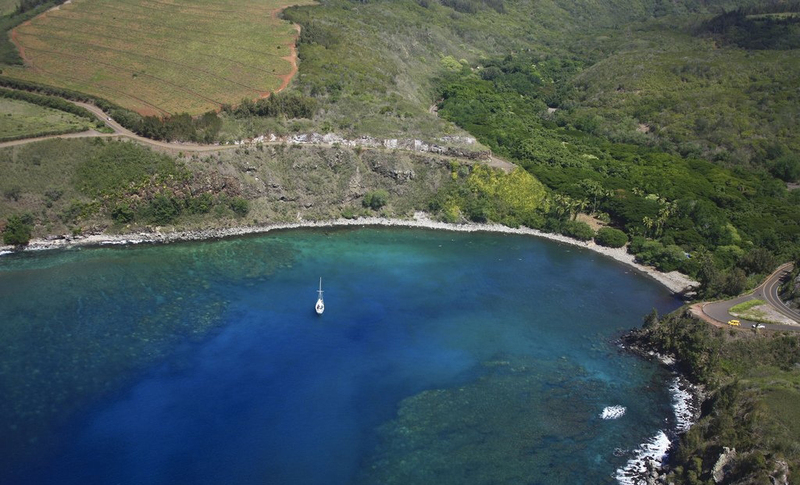 In 1979, the Honolua-Mokulēʻia Marine Life Conservation District was established to conserve and replenish marine resources in Mokulēʻia and Honolua Bays. With the protections and management through the Marine Life Conservation District, Honolua has some of the best snorkeling on Maui. 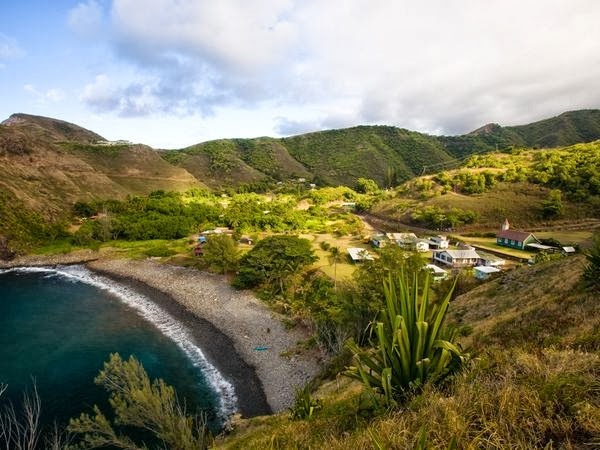 Today, on a good day, Honolua is reportedly one of the best surfing spots in the world. Breaking wave heights associated with the largest north and northwest swells range between 10-20-feet near Honolua Bay. The image shows Honolua Bay. In addition, I have posted other images in a folder of like name in the Photos section on my Facebook and Google+ pages.